Abnormalities may cause calving problems. Occasionally, a difficult calving is caused by a skeletal defect in the fetus. As stated by David Steffen, diagnostic pathologist and professor at the University of Nebraska, some congenital defects (present at birth) are due to accidents in fetal development. Others are caused by teratogens, which are defined as factors that cause an abnormality in a developing embryo or fetus. Teratogens include drugs, hormones, chemicals, viruses, toxic plants, high body temperature, etc. Some of the resulting abnormalities may cause dystocia. Vulnerability varies at different stages of gestation. Each organ and structure has a critical period of development during which it can be altered by harmful external influences. Vulnerability varies at different stages of gestation. Each organ and structure has a critical period of development during which it can be altered by harmful external influences. Many organs are susceptible in the embryonic stage, but the heart, cerebellum and urinary tract develop in later fetal stages. "Dose, duration and timing are the main factors that determine what the outcome is, and whether a teratogen will produce a birth defect. The higher the dose, the longer the period of exposure and the time of gestation will be key factors," explains Steffen. Resulting skeletal abnormalities may hinder passage of the fetus through the birth canal. "Lupine, hemlock or other plant alkaloids or toxins can affect the nervous system of the fetus. Some viruses can also cause these abnormalities. In order for the legs and joints to be mobile and develop normally there must be a normal nervous system," he says. If the legs can't move very well, muscles atrophy and joints become stiff. Certain malformations are inherited defects. Many of these are simple recessives; the defective gene must come from both sire and dam in order for the defect to show up in the calf. In calves with arthrogryposis multiplex (AM, or curly calf syndrome), legs are crooked and twisted in different directions. Click here for an informational Q&A about AM, including pictures, published in the February 2009 Angus Journal. "Whether or not this fetus can be delivered will vary with the size of the calf. Many of the arthrogryposis calves we see are small, and even though there's a dystocia, you can usually manipulate the legs and get the calf out. With the larger ones, it can be a problem," says Steffen. 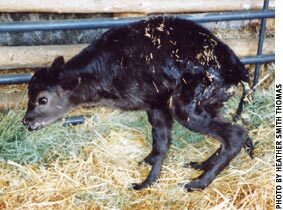 An example of a calf with contractural arachnodactyly (CA), called fawn calf syndrome. Another inherited defect is contractural arachnodactyly (CA), called fawn calf syndrome. A University of Illinois research team identified the mutated gene causing this defect, which is inherited as a simple recessive, and developed DNA tests to identify CA carriers. Affected calves have skeletal abnormalities that include a long, arched back with short underline; long leg bones; and long, weak pasterns. Even though many of these calves are unable to stand without help, most of them do survive. Some cases are subtle enough that the calves tend to grow out of it, according to Steffen. But the skeletal malformations may cause dystocia. Click here for more information about CA. The American Angus Association Board of Directors developed policies to identify carriers and potential carriers of these genetic defects in order to protect commercial customers buying registered Angus cattle. The Angus registration paper flags animals that are potential carriers of these genetic defects and documents if an animal is tested negative or a carrier. Details of these policies are available on the Association's homepage, www.angus.org.